Since ancient times, the pundits have lamented young people's lack of historical knowledge and warned that ignorance of the past surely condemns humanity to repeating its mistakes. In the contemporary United States, this dire outlook drives a contentious debate about what key events, nations, and people are essential for history students. Sam Wineburg says that we are asking the wrong questions. This book demolishes the conventional notion that there is one true history and one best way to teach it. Although most of us think of history -- and learn it -- as a conglomeration of facts, dates, and key figures, for professional historians it is a way of knowing, a method for developing and understanding about the relationships of peoples and events in the past. A cognitive psychologist, Wineburg has been engaged in studying what is intrinsic to historical thinking, how it might be taught, and why most students still adhere to the \u0022one damned thing after another\u0022 concept of history. Whether he is comparing how students and historians interpret documentary evidence or analyzing children's drawings, Wineburg's essays offer \u0022rough maps of how ordinary people think about the past and use it to understand the present.\u0022 Arguing that we all absorb lessons about history in many settings -- in kitchen table conversations, at the movies, or on the world-wide web, for instance -- these essays acknowledge the role of collective memory in filtering what we learn in school and shaping our historical thinking. "Sam Wineburg has not merely contributed to our understanding of how history is created, taught and learned; he has nearly singlehandedly forged a distinctive field of research and a new educational literature. This volume brings together a decade-long record of conceptual invention and methodological creativity." "With this volume, Sam Wineburg firmly established his place as the pre-eminent North American researcher in history education. His chapters range from insightful scholarly mediations to innovative empirical studies. He examines the knowledge and practices of historians, history teachers, and young people, as well as the vibrant field of research that has recently developed around these issues. Historical Thinking makes a vitally important contribution to our understanding of how we think and learn about the past." "Historical Thinking is intellectually substantive, integrative, and timely. In the midst of all the talk about new technologies, distance learning, and standardized testing, his fine-grained inquiries into learning and knowledge are a sobering reminder that educators have a lot to learn about learning." "This is a wide-ranging and at times inspirational work." 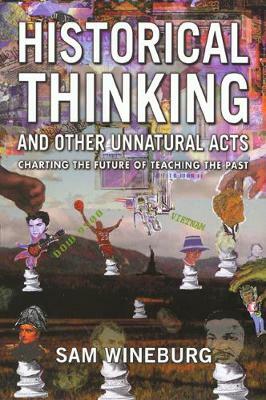 "Arguing that we all absorb lessons about history in many settings-in kitchen table conversations, at the movies, or on the world-wide-web, for instance-these essays acknowledge the role of collective memory in filtering what we learn in school and shaping our historical thinking." "Historians, especially academic historians, who normally avoid the literature on history education for its banality, thin research base, or ideological cant will overlook this book at their peril. Sam Wineburg brings both a burning concern for the state of history instruction and a wide knowledge of history to his research agenda." "The author of this collection is passionate about the teaching of history. ...students are encouraged to put themselves into the shoes of the people whose actions they are studying in order to arrive at their own understanding of what they had done." "For Wineburg the study of history commends itself as a unique and complex way of knowing the world that must, if it is to realize its full potential as a humanistic discipline, embrace a paradox: that of seeing the past as at one and the same time familiar and strange.